I was delighted that last week’s post about performance against ranking in the 2013 football season benefitted from Stephen Downes‘ comments. Stephen made some excellent suggestions about visualising performance. I am working on some changes but I thought I would present some brief observations about last week’s football games. 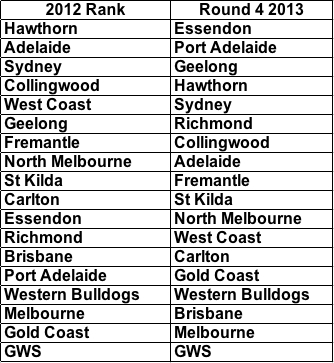 This week, Sydney, West Coast and St Kilda lost to lower ranked opponents from 2012. All three lost at home (to Geelong, Carlton and Essendon respectively). The Western Bulldogs were the second team this season to score 0 points in a quarter. Their second a third quarter total (1) is the lowest combined score this season. Their total score (28) is the lowest of the season too. I have started monitoring end of third quarter scores in relation to overall game success. To date six teams have overcome a third quarter deficit to win. Melbourne’s fourth quarter recovery is the best this season. This was a bye week in the NRL. There was an international fixture between Australia and New Zealand in Canberra. It was an interesting Week 10 in Super Rugby. 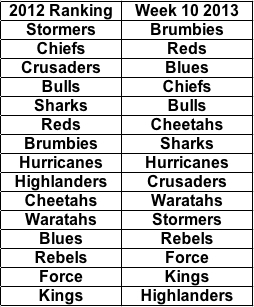 The Chiefs and Sharks lost to lower ranked teams from 2012 (to the Waratahs and Cheetahs respectively). The Reds and the Brumbies fought out a tense 19 point all draw. This was the Brumbies’ second draw of the season. The Highlanders lost their eighth game of the season and remain the only Super 15 team without a win this season.